Everyone’s afraid of the unknown. It’s natural. Personally I won’t eat squid…not because I don’t like it but, I’m afraid of what it might taste like. But that’s just plain silly. There’s one area of sales that everybody hates to do…Cold calling – the dreaded task of picking up the phone and calling someone they’ve never spoken to before. Why? ?Because they’re afraid of being rejected. Mark Cuban is a very smart businessman. He was featured in a front-page article in The Wall Street Journal. What’s the “easy” way to make a living as a salesperson? How can I make lots of money without having to call on people? How can I get people to call me, so I don’t have to call them? As part of your small business marketing effort you make calls to prospects. Working from your list of leads you pick up the phone to call a prospect. What happens? 80% of the time, the person you’re trying to call isn’t there. Of course you leave a message. Then what happens? Usually nothing. You don’t get any return calls even if you make a hundred. Well maybe one. 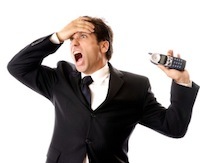 What’s the one mistake most small business owners make marketing their business over the phone? They leave a message that pitches their products and services. Trying to sell cold over the phone is the best way to ensure you won’t get a call back. Instead your objective should be limited to one thing. Focus on trying to get your prospects to return your calls. Don’t try to sell anything when you leave a phone message.